Windy with showers and thundershowers likely. High 69F. Winds SW at 20 to 30 mph. Chance of rain 80%. Higher wind gusts possible.. Rain likely. Low 43F. Winds NNW at 10 to 20 mph. Chance of rain 100%. Rainfall may reach one inch. Patrick Henry juniorWil Morrow wrestles during the state tournament Friday on the campus of Ohio State University. Archbold’s Zach Rocha sizes up his opponent during the state tournament Friday at Ohio State University. Liberty Center senior Caleb Carpenter wrestles Friday in the state tournament at Ohio State University. Carpenter will wrestle today for a state title. Patrick Henry junior TJ Rhamy goes for the pin during the state tournament Friday at Ohio State University. Napoleon senior Caleb Hernandez stays on his feet during the state tournament Friday at Ohio State University. Napoleon senior Caleb Hernandez tries to regain the upper hand during the state tournament Friday at Ohio State University. Liberty Center’s Dylan Matthews tries to work his opponent to the ground during the state tournament Friday at Ohio State University. Archbold’s Kasyn Schaffner sizes up his opponent during the state tournament Friday at Ohio State University. Liberty Center senior Tyler Kay wrestles from his feet during the state tournament Friday at Ohio State University. COLUMBUS – In his final state tournament, Liberty Center’s Caleb Carpenter has reached the pinnacle. 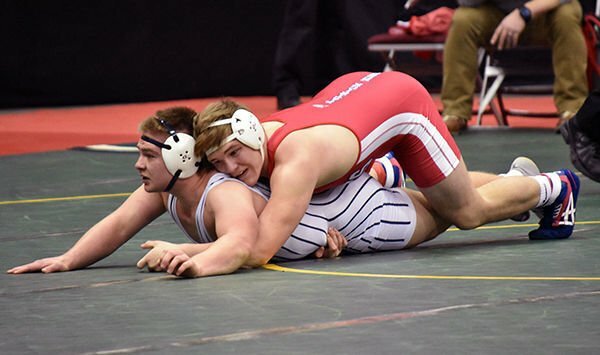 Carpenter, a senior who has wrestled at the state tournament all four years, defeated Garrett Neth of Allen East 6-4 in the Division III 195-pound semifinals to reach the state championship match tonight at the Schottenstein Center on the campus of The Ohio State University. After a scoreless opening round, Neth chose to start the second period in the down position and Carpenter quickly turned him and scored 3 near-fall points. Neth reversed the position for 2 points, but Carpenter scored an escape point before the end of the period for a 4-2 lead. Carpenter increased the lead with an escape to start the third period, and after a stalling penalty on Neth, all that was left was the ride out the final seconds. Carpenter is attempting to become the seventh state wrestling champion in school history. Both wrestler and coach said scoring the near-fall points were huge. “Any points you get down here are big,” said Westhoven. Carpenter (37-1) will face Ryan Boyle of Roostown for the state title. Carpenter advanced to the semifinals by pinning Matt Schemersal of Ottawa-Glandorf (2:59) and defeating Jake Loar of Massillon Tuslaw 8-3. After the match was tied at 3, Carpenter scored the final 5 points against Loar. Patrick Henry’s Wil Morrow and Napoleon’s Caleb Hernandez each lost semifinal matches to undefeated wrestlers. Morrow (220 pounds) lost to defending state champion Hudson Jump of Grandview Heights 23-7. Morrow (33-2) wrestles this morning for placement on the podium. Morrow advanced to the semifinals with a 16-0 win over Dalton Rice of Sarahsville Shenandoah and a 4-1 victory over James Peters of Blanchester. Morrow scored a first-period take down against Peters and pulled away with an escape in the third period. Hernandez fell short of the championship match at 113 pounds in Division II, losing 18-3 to undefeated Cael Woods (47-0) of Millersburg West Holmes. Hernandez had a pair of close matches in the opening two rounds to advance to the semis. He edged Jake Hamulak of Chardon 3-2 in the first round and topped Mark Emmerling of Lisbon Beaver 8-2 after scoring four near-fall points in the second period. “He had two good wins, especially in the first round,” said Napoleon coach Jason Seiler. “He beat that kid earlier in the season, but that match did not go anything like the first time. 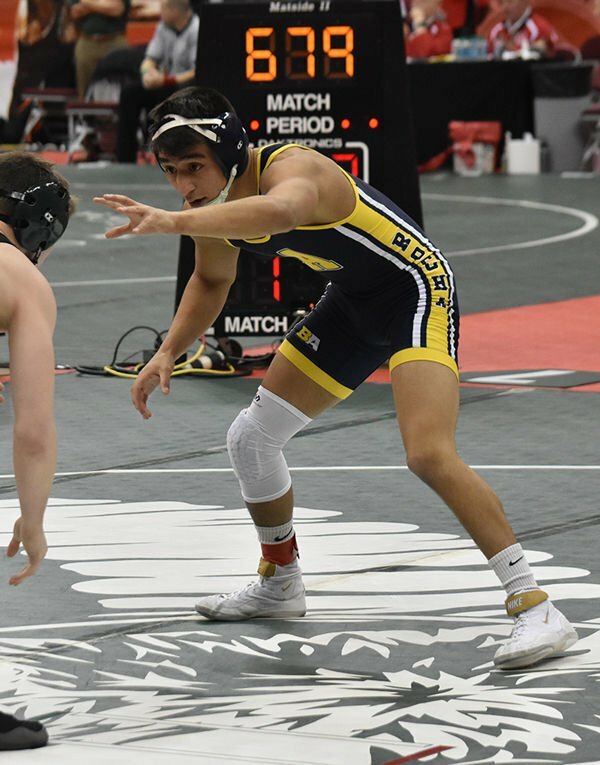 Hernandez, who is now 46-8 on the season, will wrestle in the consolation quarterfinals and a state placement match this morning. After winning on Thursday, Patrick Henry’s TJ Rhamy had to wrestle three matches Friday to advance to Saturday’s placement matches. Rhamy (160 pounds) defeated Josh Fink of Coldwater 7-0 Thursday. He lost his quarterfinal match Friday morning 2-0 in overtime to Mason Kuneff of Bridgeport and then rebounded with a 12-5 victory over Deontac Davis of Cory-Rawson in the consolation bracket. In the evening session Friday Rhamy pinned Hayden Pummel of Indian Lake in the third period. Rhamy was trailing most of the match, but scored a take down early in the third period and put Pummel to his shoulders for the win. Liberty Center’s Dylan Matthews advanced to Friday’s evening session despite losing his first match Thursday. Matthews (120 pounds) lost to Jackson Reineke of Gates Mills Hawken 5-2 in the opening round, but advanced to Friday with a 9-3 victory over Joseph Bonfini of Bellaire. On Friday, Matthews defeated Austin Guthrie of Coshocton 3-2 before losing to Brandon Hahn of Eastwood 10-2 to end his season at 39-11. Tyler Kay had a tough day Friday, dropping a pair of matches to see his season come to an end. Kay, 152 pounds, won his opening-round match 5-4 over Dylan Schneck of Milton-Union Thursday night. However, he lost his quarterfinal match to Noah Inboden of Nelsonville-York 7-5 and then was defeated by Swanton’s Ryan Martin 6-4. Kay finishes the season at 43-11. Liberty Center’s Cameron Henneman lost both his matches at the state meet Thursday. Henneman, 113 pounds, lost to Max Shore of Miami East 18-2 in the opening round and fell to Dominic Savoc 3-0 in the consolation round to end his season at 38-14. Wauseon’s Gavin Ritter and Xavier Torres will wrestle for state titles. Ritter moved on after defeating Josh Dunn of Goshen 2-0 in the Division II 120-pound semifinals. Ritter advanced to the semifinals with a 7-0 victory over Chanston Moll of Williamsport Westfall and a 1-0 win over Tyler Masters of Millersburg West Holmes. Ritter (51-4) will face Garrett Lautzenheiser of Lousiville (41-4) in the title match. Torres defeated Cole Hivnor of Mentor Lake Catholic 2-1 in the 170-pound semifinals. Torres advanced to the semifinals by pinning Beau Smith of Lisbon Beaver (3:19) and defeating John Mark Williams of Indians Hill 9-5. In the championship match, Torres (50-5) will face Lucas Salmon of Sandusky Perkins (48-8). All three Archbold wrestlers had their seasons come to a close in the first session Friday. Zach Rocha (132) lost to Trent Duvall of Rootstown 10-4 in the opening round before defeating Collin Wiley of Caldwell 8-7. On Friday, Rocha lost to Klay Reeves of Johnstown Northridge 3-1. Rocha ends the season at 50-14. Brennan Short (138 pounds) lost his first-round match to Niko Chilson of Rootstown 11-2, but bounced back to defeat Sam Patterson of Batavia Clemont Northeast 11-4 Thursday night. On Friday, Short (41-19) fell to Parker Watson of Rocky River Lutheran 6-2. At 160 pounds, Kasyn Schafner lost to Seth Henderson of Miami Valley Christian Academy in the opening round 9-3. He then defeated Cody Albaugh of Bellaire by pin in 59 seconds. Schafner (28-13) closed his season with a 9-3 loss to Hayden Parmell of Lewsitown Indian Lake. Wauseon’s Damon Molina (106 pounds) won his opening-round match Thursday, defeating David Woolever of Carrolton by pin (1:58). Molina then lost both his matches Friday, falling to Brendan McCrane of Mentor Lake Catholic 8-0 and Kaleb Reams of Springfield Shawnee 4-0. Molina finishes the season at 39-14. The State Wrestling Tournament concludes today, with placement matches beginning at 10 a.m. and championship bouts set for 5:30 p.m.